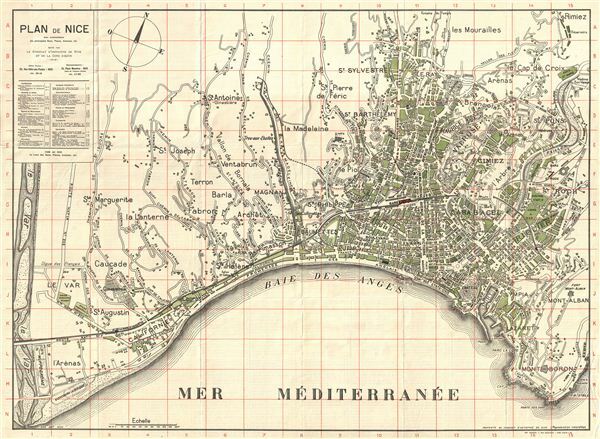 extremely attractive plan of Nice in 1920, showing individual building footprints and with a legend identifying various museums, newspaper offices, social clubs and sights. Wonderful French typography and drawing style make this an extremely desirable map and really convey the feel of post-war, 1920s France, on the eve of one its most glorious decades. edited by the Syndicat d'Initiative de Nice et de la Cote d'Azur, and engraved by Gandini, Nice. Very good. Original fold lines exhibit some wear.